Artistic rendition of a "superflare star". It has large starspots (much larger than those on the Sun) and a superflare (white region) occurs near the starspots. Stars like our sun can release "superflares," explosions of up to 10,000 times more energy than the solar flares seen from our sun, researchers say. However, it looks unlikely that our sun currently has superflares, scientists added. Astronomers have previously detected superflares from a variety of star types, which release bursts that have 10 to 10,000 times more energy than the largest solar flare ever detected from our sun. Scientists wanted to know how common these outbursts might be from stars like the sun — those with masses and temperatures similar to our star. Even normal solar flares can damage satellites, endanger astronauts and wreak havoc on electrical grids on Earth, suggesting that superflares might be catastrophic to life on Earth. Until now, few superflares have been detected from sunlike stars. This rarity has hampered detailed analysis of what might cause them to happen. Now, with NASA's Kepler planet-hunting satellite, researchers have a way to analyze many sunlike stars at once. The scientists monitored about 83,000 sunlike stars over 120 days and detected365 superflares from 148 of the stars, each lasting one to 12 hours. Somewhat regular fluctuations in the brightness of the superflaring stars hints they all possess large starspots, much larger than the sunspots seen on our sun. This suggests they are caused by magnetic activity of the stars, just as solar flares are linked with sunspots and solar magnetic activity. Rapidly spinning stars are expected to experience more magnetic activity than slower-whirling ones, which likely explains why they have more superflares. Scientists had thought superflares of sunlike stars were caused by magnetic interactions between the stars and so-called hot Jupiters — gas giant planets orbiting extraordinarily near their stars, at a tenth or less of the distance of Mercury from our sun. However, the researchers found that no hot Jupiters were discovered around any of the superflaring stars they studied, suggesting that superflares from sunlike stars are actually only rarely linked with hot Jupiters. Artistic rendition of a "superflare star" (before the superflare occurs). On average, sunlike stars appear to release superflares 100 times stronger than any known solar flare about once every 800 years, and flares 1,000 times stronger than solar flares about every 5,000 years, researchers estimated. Still, that might not mean that a superflare 100 times stronger than any known solar flare really happens every 800 years — for instance, a sunlike star might release 100 superflares in 10 years, but then no more for another 79,990 years, which would still produce the same average, said study lead author Hiroyuki Maehara, an astronomer at Kyoto University in Japan. The researchers noted there is no historical record of superflares from our sun in the past 2,000 years, and strong evidence indicates that there has not been one in the past billion years. "Most superflare stars have large starspots, but the present sun does not," Maehara explained. "Further studies are necessary to understand why and how such large starspots are formed on solar-type stars, and whether our sun can produce superflares." 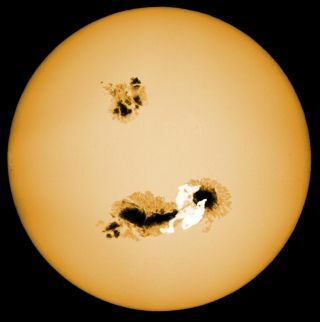 To know whether superflares happen on the sun, "we need detailed observations — for example, high-resolution spectroscopy — of superflare stars, which allow us to know whether superflare stars are really similar to our sun," Maehara told SPACE.com. The scientists detailed their findings online May 16 in the journal Nature.